The above photograph of President Jonathan on stage is “historic” to all Nigerians depending on one’s school of thought. Both friends and enemies of GEJ, APC and PDP all have different view about the message of the picture. No matter your school of thought, I’m very optimistic that this picture is not one of the good pictures President Jonathan will love to see in his album. If it were in the analogue age, the photographer of any news media that snapped the picture must be a guest of our security agencies. The picture went viral on April 15th 2014 after PDP rally in Kano to welcome Mr Shakarau that was displaced in APC by Governor Kwankwaso. Terrorism can be scary or terrifying. It is not the wish of any President or Governor to encounter it no matter how equipped or fortified your security/defense is. Let us recall that President George Bush was flown into Air force base in Louisiana from Sarasota Florida when the World Trade Centre was struck due to concern that he would be targeted by terrorists. Take note also that George Bush first National security meeting was through electronic means at Strategic Air command in Nabraska before returning to the white house. This example is a typical demonstration of how every leader trembles at the mention of terrorism. What vindicates or vilify leaders are your actions and reactions after terror attack. George bush statements after 9/11 restored Americans confidence on him. It was on record that Bush had 24(twenty four) national security meeting between September 11 to October 11. That is leadership redefined! The kidnap of over 200 school girls of Chibok in Borno state on the 15th of April while Mr President was attending the PDP rally in Kano was not the first of its kind nor the worst done by book-haram insurgents. School children were once massacred in their dormitories; over 20 pupils were kidnapped in the wake of missing Sanusi 20 billion dollars. Plus other heinous massacre that took place in Yobe, Nasarawa, Niger, Plateau and Adamawa states respectively. All the reasons cited by Labaran Maku to defend the Kano dance was more of fueling the burning bush. Maku said,” the Terrorist aim is to stop governance and the dance/rally in Kano was to prove them wrong”. Some thinkers like Maku bought into that disgusting statement but I’m sure that no national election is fast approaching and therefore, the rally can be postponed for another day. Moreover, when does rally become part of governance? Rally is weapon of political parties not weapon of governance. Any action labeled governance must be for the interest and benefit of the nation not political party. Furthermore, how does GEJ glorifies and celebrate frustrated enemy in the event of national calamity? Is he joining GEJ because he likes him or is he joining out of frustration? What brought Shakarau to Jonathan? If not for APC leadership tussle between him and Kwankwaso, will he not be one of the leaders of the opposition in Nigeria today? No matter your political affiliation, Shakarau is never a plus to GEJ and people of Kano can has proved it in the just concluded LGA election. Some shallow readers will argue that LGA election is not a measure of one’s political strength but I will refer them to Edo and Anambra State LGA election where (LP) Ifeanyi Uba and (PDP) Tony Aninih proved their political worth in their local governments. I expected Shakarau to do the same in Kano but he couldn’t. Therefore, GEJ and his advisers failed woefully on that Kano rally. Some has also underrated the consequence of incompetent advisers and lack of political intelligent unit. But success of George Bush can be attributed to his team of professional staff and his humility to listen to every one of them. I do not expect every leader to be an orator nor has exceptional vision like Obama or Clinton. But I will not also spare these GEJ advisers who are the worst I have ever seen in my life. I’m sure not even Satan can tolerate their advice. Rather than summoning for national security meeting after the Nyanya blast, the advisers confused GEJ and converted it to PDP meeting signaling politicization of national security. Blame game rather than united front was the outcome of the meeting. Reno Omokri(PA new media to GEJ) added more fuel to the fire by telling public lie that APC governors boycotted a security meeting which they conspired to convert to party meeting. This is a very shameful act in the light of sorrow and grief in the land. What broke the camel’s back was the misinformation, lies and attempt to blackmail or sabotage, the struggle to rescue the abducted Chibok girls by the presidential advisers. The misrepresentation of the #BringBackOurGirls clamor as people opposing the government was the first evil plot of this group of advisers. We all laughed at the “open assassination of grammar” by the first lady but the bitter truth we must accept was that she strongly believe that there was no kidnapping and there was grand conspiracy against her husband (this might not be totally wrong assumption though) but condemning the apolitical citizens that felt sympathy for the victims of this kidnap is condemnable. The gap between the time the advisers were deceiving GEJ that the kidnap was the handwork of the opposition, and the time it took them to thread blames and the time it took them to resolve to take action due to mounting international pressure was what forced GEJ to surrender our sovereignty. Let us also have another deeper look of what would have happened if not for this evil advisers. Patience Jonathan as mama peace should have matched to Presidency leading other first ladies, senators and all women to demand #BringBackOurGirls. Her pressure with other elite will exonerate her and citizens will understand her limitation. But this evil advisers converted this woman into another Co-President torturing” the pricipa on national television because na only she waka come”.She did not stop there, she directed the protesters to proceed to Bornu state. The police in their usual manner rather than securing innocent citizens went to disperse them at unity fountain. This again raises more concern globally that GEJ is hunting for citizens rather than terrorists. All this statement/blames/excuses and lies falls short of a responsible government that couldn’t safe guard her citizens. This statement diminishes the world perception of GEJ both home and abroad. The advisers did not stop there; they have not seen the need for him to visit Chibok. Why not deploy all the military men both police to guide GEJ to visit chibok? The excuses cited by GEJ on why he has not visited Chibok is not convincing. It was shameful to behold GEJ before the world press in France citing moral boast as the only advantage of visiting Chibok yet he never deem it fit to give this moral boast to those families. We should recall that Gov Shettima defied military advice not to visit Chibok and went unhurt. GEJ should be courageous to show leadership as CinC. Obama sneaked out of white house unannounced and visited American troops in Afghanistan recently. Chibok visit will enable GEJ to have one on one conversation with the military boys in war front. One of them might reveal to him what the senior MILADS might be hiding away from him. The visit will unravel to GEJ the rumor of hunger, lack of welfare and equipment being speculated. He will be a morale booster for the families and the military but the advisers will never let it happen. This was how they deceived him in Yobe until the Progressive Governors visited and walk the street of Yobe. 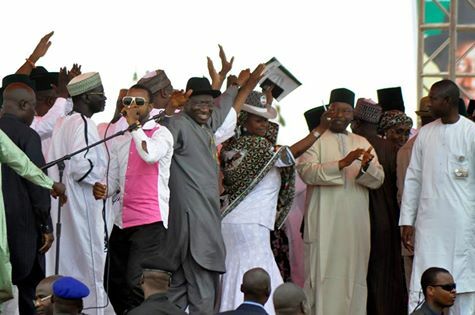 GEJ aftermath visit was much reactionary and no citizen bought into it. Any visit by GEJ to Chibok today is meaningless because the opportunity is gone for good. Not up to 12 hours after twin bomb blast in Jos, one of the presidential aides rushed to BBC to say that “there was no evidence that the Jos blast was detonated by Boko Haram”…. I ask when he started investigation or gathering of evidence. Why sudden conclusion? Who then bombed Jos if not Boko Haram? Citizens are free to speculate based on their personal perception and political inclination but any comment emanating from the presidency MUST be swift, accurate, factual, well evidenced and undisputable. The statement must be of objective and devoid of any sentiments.